Tintin’s adventures with his friends have for decades fascinated young and adult readers. Their popularity in Europe can only be compared to that of Asterix. He doesn’t have much personal life, or a girlfriend, and his home is furnished like a monk’s chamber. .this is a little histoy about a great men..HERGÉ. 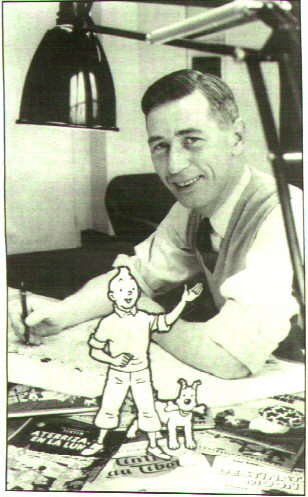 Hergé was born Georges Rémi near Brussels, the son of Alexis Remi and Elisabeth (Dufour) Remi. His father was employed in boy’s outfitters and was especially skilled in sketching clothes models. Hergé was educated at the Ixelles primary school (1914-1918) and then at St. Boniface’s. At the same time as he entered the Catholic college he changed from the non-religious ‘Boy-Scouts of Belgium’ to the ‘Federation of Catholic Scouts’. 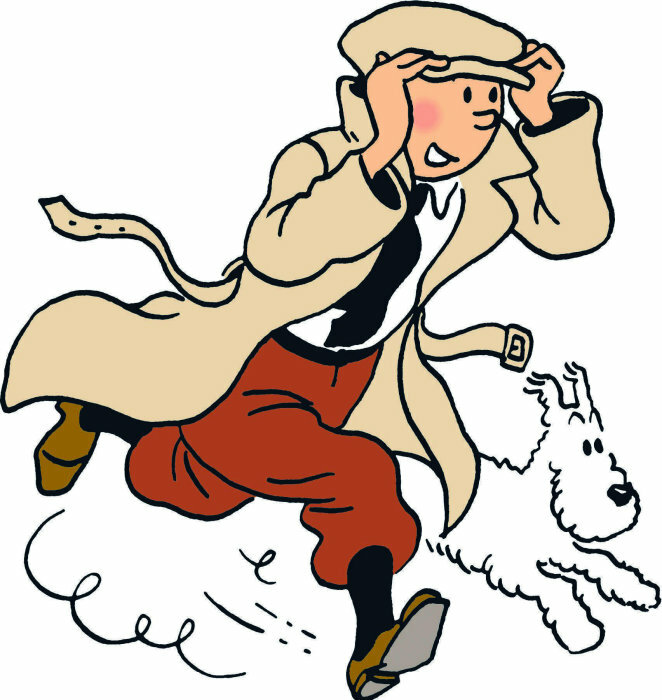 Hergé has characterized his childhood as grey and joyless, but later in the character of Tintin, he created a kind of alter ego, his younger self, whose life is colorful and full of action. Hergé did not have much formal education in graphic arts. For a short time he was enrolled for drawing lessons at Ecole Saint-Luc, but he left the school when he was told to copy a plaster Corinthian capital. Hergé created Tintin and Milou (Snowy in English) in 1928 for Le Petit Vingtième, the weekly supplement of Le XXe Siècle. Tintin was a Catholic reporter, who fought against evils of the world, starting from Communism and atheism. 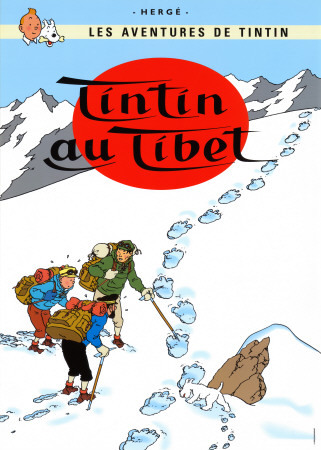 The adventures of Tintin were later reprinted in book form, first in black and white and from The Shooting Star (1942) in color. His first story, Tintin in the Land of the Soviets, was a political satire, partly based on Joseph Douillet’s book Moscou sans voiles.Hergé’s artwork was still awkward, but there can be seen a great improvement between the first and the last pages of the album. Due to political reasons, the work was not published in Finland until 1986. In the 1930s Hergé also created a new series and produced a number of book and magazine covers. The Adventures of Jo, Zette and Jocko was about a boy, girl and their chimpanzee, and Quick et Flupke was about two Brussels rascals. While working with Le Lotus bleu (1936, The Blue Lotus), his first masterpiece, Hergé met Tchang Tchong-Yen (1907-1998), an art student and poet, who deeply influenced Hergé’s view on Chinese culture. After returning to China, Tchang established his fame as one of the most important artists in his country. Hergé and Tchang met again 1981. At that time Hergé had adopted some Buddhist views on life, but Tchang was a devoted Catholic. In 1971 Hergé travelled to the United States for the first time – Tintin had been there already nearly 40 years ago. In 1973 he visited China. 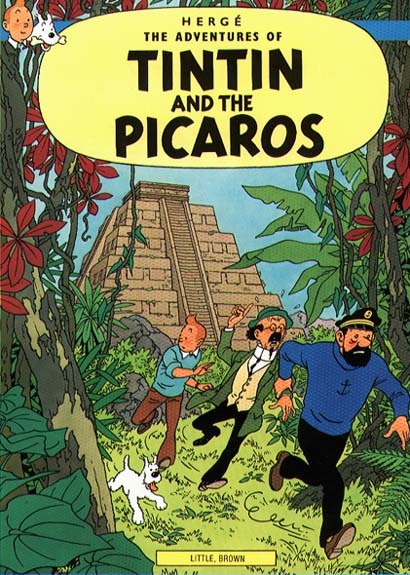 Hergé’s last work was Tintin and the Picaros (1974). He planned a story set in the modern art world but it was never finished. Hergé died on March 3, in 1983, at the Saint-Luc University clinic. The unfinished Tintin adventure Tintin et L’Alph-Art appeared in 1986. Hergé had been an avid collector of modern art and this work was inspired by his interest in the world of painting. At the end of an episode, Tintin is in danger, facing the prospect of being turned into a sculpture. “… I really do not know where this story will lead me,” Hergé had said just three months before his death. I like Tintin..and you ?